Have you ever found yourself out and about and needed to send a photo or document but were nowhere near a scanner? If you fit into that category you'll be happy to know there's a solution: Why not use your PlayBook? The developer behind SayIt, BachKhoa University, has been hard at work to make sure you'll never be stuck again with their first PlayBook application called Handy Scanner. Just as the name implies it's a simple to use application that lets you "scan" just about anything with your PlayBook's rear camera and convert it to an easy to open PDF file in a matter of moments. Click on the jump to find out more. Handy Scanner employs an extremely user-friendly interface that shows everything you need right in front of you without the need to tap through multiple menus or swipe for different options. To use, you'll first need to enter in the name of your PDF file in the field at the top. Next, you'll need to select your options such as portrait/landscape or stretch mode (which we'll get to later). Keep in mind you must hold your PlayBook in the proper orientation once selected. Then simply choose either to take a new image or import an existing one and tap the create button to convert. Handy Scanner allows users to snap multiple shots as additional pages in the electronic file. However, oncemultiple pictures are captured, they cannot be moved or replaced after the file is generated. Files are stored in the documents folder and you can choose to open right away by tapping "Open PDF" or access it later using the Browse option in the upper left or with the PlayBook's File Manager application. Now here is where this application differs from the competition. Handy Scanner gives you the option at the time the photo is captured whether or not you want to keep it. So instead of having to modify or edit the document later you have the opportunity to retake it before the file is generated. Another feature I like is that you have direct access to your camera, which means you can zoom in to adjust the shot and even swap to the front camera. 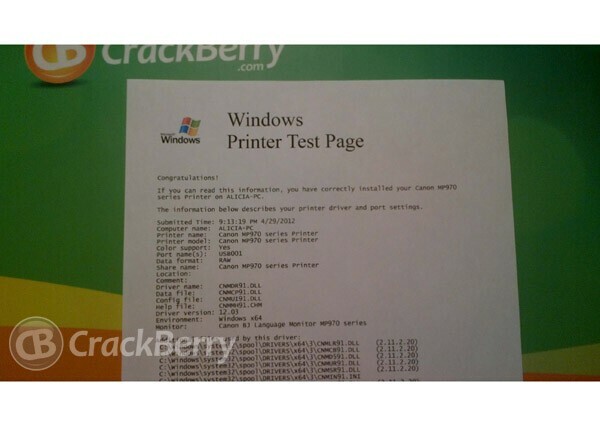 No matter what the source, Handy Scanner does a great job of converting images into a PDF. Now keep in mind that quality is dependent upon the camera being used. 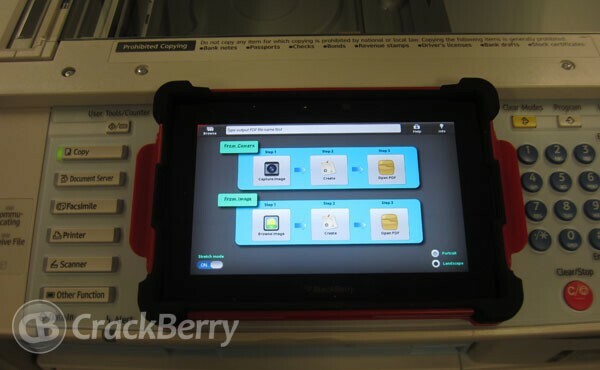 In this case it is the PlayBook's 5MP rear camera. As long as you have proper lighting and a steady hand the final product is decent and makes life easier if you need to send an actual document or scan receipts for your expenses. I know my Boss is always forgetting them and for those of you on the go now you can just scan them with your PlayBook to save for later. Take a look at the examples below. One of the complaints that both myself and others had in the forums was the lack of a crop feature. The scanner uses the A4 paper size which is the standard format in certain countries and is 8.3 X 11.7 which some people may not be used to. For those of in the U.S. who use legal and letter size of 8.5 X 11 and 8.5 X 14, consider this a warning before printing. As you've no doubt noticed in the images above, once converted, white borders appear either on top and bottom or on the sides when scanning in portrait or landscape mode. This is where the stretch mode option I mentioned earlier comes into play. While it remedies the issue, the effect is noticeable in the final product which is slightly skinnier than the original. Good news is the developer is working on a crop feature that will be available in future updates. 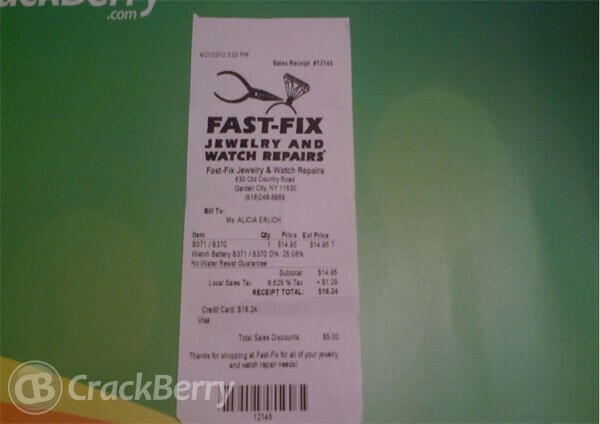 As the name implies, Handy Scanner is just that. It may not have all the bells and whistles of its competitors but it's always within reach, is extremely user friendly, and does a great job of digitizing your paper documents. While it lacks the ability to set page size or crop the image (which is coming soon), I've been scanning everything from business cards to receipts and even images of my car.